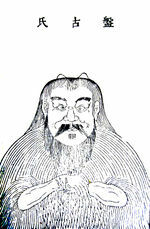 A portrait of Pangu in a "primitive man" dressing. Oriental creation myths are ancient myths regarding creation in Eastern Asian countries, some of which are still told today. Most creation myths have some kind of similarities with theistic Creation, and some believe that these countries have misinterpreted the Biblical creation account. Some Asian countries still practice their traditional religions. Koreans still worship their ancestors by placing food in front of their national temples during a national holiday. The Japanese and Chinese also have similar practices during major national holidays. There are still homes that practice these mythical ceremonies. After the arrival of Christian missionaries from the west, the practices have declined. Hwangung is a Korean mythological character, who has been claimed to have created the universe. Hwangung, according to the mythology, is a prince of Heaven, and was sent to Earth to create this world. Hwangung wanted to create a world. So one day, he asked his father if he could create a world under Heaven. His father granted his wish, and let him create a world for humans. Hwangung then brought 3000 followers to help him create the world. He also brings three ministers, the Earl of Wind, the Master of Rain, and the Master of Clouds, for assistance. The ministers assisted Hwangung by determining good and evil and controlling materials that humans needed, like grain, life, or sickness. One day, a bear and a tiger came to Hwangung to ask for a favor. They wanted to be humans, and Hwangung had the power to change them. Hwangung told the animals to stay in a cave and only eat a bundle of mugwort and twenty bulbs of garlic for one hundred days. They were not allowed to see the sun nor eat anything else other than what was given. The tiger wasn't able to follow the task, but the bear was. After suffering from such boredom and awful food, the bear was awarded, and has become a beautiful human being. 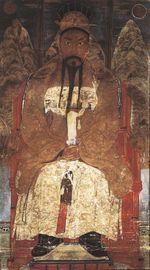 Afterward, the bear married Hwangung, and became the queen of the world. She then gets pregnant, carrying the baby of Hwangung. The baby was named Dangun, the first born human being and king of the world. Hwangung assigned Dangun to lead this world, and according to the mythology, that's how the first ever nation (Gojosun) was built. Nowadays, the name Gojosun is still used in North Korea. North Korea's official name is Democratic People's Republic of Korea, but in Korean, they call themselves 'Josun-MinjuJuih-Inmin-Gonghwagook (조선민주주의인민공화국)'. The Chinese believe that in the beginning, the Universe was just there, but in a chaos. The universe had a black egg within the chaos, and Pangu came out from the egg after 18,000 years of sleep. When Pangu was born, the upper part of the egg shell became the sky (Yin) above him, and the lower part of the shell became the earth (Yang). Pangu had to push the sky away from the ground in order for them to be apart. The legend says Pangu pushed them apart 10 feet per day. During that time, a turtle, a qulin, phoenix, and a dragon helped him to hold the sky from falling. When Pangu had died after 18,000 years, the remaining parts of his body made up what is now Earth. Humans were created from some parasites on his body. Pangu is still in charge of the weather even though he died. The chart shows what functions of Earth Pangu left. This legend varies by region in China. They all share the story of Pangu, but each is a bit different. One version says that Pangu formed the Earth with a chisel and hammer. Another version says it wasn't Pangu who formed humans, but it was another goddess who later formed humans. 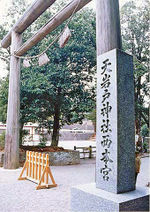 A national temple that worships the ancient Gods in Japan. In the beginning, there was only chaos. There was no land, but only sea. Some Gods looked down upon Earth and decided to do something about this chaos, so they have created several deities to take good care of the Earth. The three deities were named Ame-no-Minaka-Nushi-no-Mikoto (the Deity-of-the-August-Center-of-Heaven), Takami-Musubi-no-Mikoto (the High-August-Producing-Wondrous-Deity), and Kammi-Musubi-no-Mikoto (the Divine-Producing-Wondrous-Deity). These Gods were born in the sea and each of them had abilities. When Ame-no-Minaka-Nushi-no-Mikoto (イザナミ) came out of the sea with a spear, there were a couple dribbles of water, which created what is now Japan. The islands came out of nowhere. After they created Japan, they started creating other continents, but Japanese believe they were the most important since they were created firstly. The Gods took extra good care of Japan by teaching them how to farm, hunt animals, and appointed a king within them. The Japanese believe that was how Kings were appointed in the past. ↑ 1.0 1.1 Korean Creation Myth University of Texas. Web. Accessed 06 January 2016. Author Unknown. ↑ 2.0 2.1 2.2 Korean Creation Myth North Austin Tae Kwon Do. Web. Accessed 06 January 2016. Author Unknown. ↑ 3.0 3.1 Korean Creation Myths Crystal Links. Web. Accessed 06 January 2016. Author Unknown. ↑ Ancient History Democratic People's Republic of Korea. Web. Accessed 07 January 2016. Author Unknown. ↑ 5.0 5.1 Chinese Creation Myths. Crystal Links. Web. Accessed 10 December 2015. Author Unknown. ↑ 6.0 6.1 6.2 Pangu and the Chinese Creation Story. Ancient Origins. Web. Last edited 16 April 2013. Author Unknown. ↑ 8.0 8.1 일본의 건국 신화 "동경고이와성산교회". Web. Last Edited 5 January 2006. Author Unknown. This page was last modified on 11 May 2016, at 16:19.